Two 84-inch Ultra HD displays were fitted into custom-made kiosks. An environment as massive and diverse as the Georgia Aquarium—the second-largest aquarium in the world with more than 60 exhibits and 10 million gallons of fresh and marine water—was searching for a new, unique way to interact with its visitors. Looking to elevate some of its digital platforms, the technology staff considered next-generation digital signage solutions for its two main galleries. After research and needs analysis, the Aquarium installed two LG 84-inch class (84.0 inches measured diagonally) Ultra HD Displays and a 2x2 direct LED video wall based on LG’s 55-inch class (54.6 inches measured diagonally) slim-bezel displays to provide an entertainment and educational experience for the two million visitors that walk through the aquarium annually. “We were looking to improve the image quality of our screens and replace the antiquated equipment we were currently using,” said Ryan Palley, senior manager of Audio/Visual at the Georgia Aquarium. The team wanted to implement an aesthetic complement, but also display the native 4K content that the Aquarium captures from around the world. 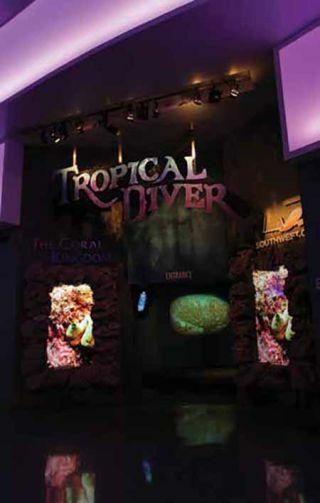 Nestled in the main atrium, “Tropical Diver,” one of the Aquarium’s six galleries, needed a way to grab the attention of passersby, drawing them in to see one of the largest living reef exhibits of any aquarium in the world. With a resolution of 3840 x 2160 pixels, the 84-inch Ultra HD displays (model 84WS70MS-B) are capable of presenting the vivid colors and fluid movement of the living corals and thousands of colorful reef fish of the tropical Indo-Pacific. The in-house audio/visual team installed two 84-inch displays overnight. They were fitted into two custom-made kiosks designed to look like coral to give visitors the experience of seeing the underwater world from eye-level. Another unique aspect of the installation is the native 4K content that Palley captured of marine life in Hawaii and the Philippines. It was essential that the displays chosen for this area were 4K capable in order to show the incredible footage with the highest level of detail possible. In addition to the two Ultra HD displays, a video wall was installed in “Ocean Voyager,” an exhibit dedicated to the Mesoamerican Barrier Reef System and the largest indoor aquatic habitat in the world. The video wall is part of Deepo’s Hideaway, a portion of the exhibit featuring an animated character, Deepo, who leads visitors through an educational experience revealing the interconnected lives of underwater creatures. To achieve the level of picture quality and operational reliability desired, the Aquarium chose four LG IPS Direct LED Super Narrow Bezel displays (model 55WV70MSB) and installed them in a 2x2 configuration. Designed for continuous operation in a public setting, the LED displays feature 800 cd/m2 brightness and a 1400:1 contrast ratio, in addition to an ultra-thin 5.3mm bezel to ensure seamless, visually appealing imagery. Each display features Direct LED backlighting technology. Facility organizers say that the Ultra HD displays and video wall have become an integral part of the “signature experience” the Aquarium offers, which is grounded on entertaining, engaging and educating. The displays have also been well received among staffers, as they require very little maintenance. Goal: Upgrade antiquated projection screens to high definition digital signage displays, creating a striking visual and interactive experience for guests. Solution: Giant-screen Ultra HD 4K displays and high-def video wall displays. Components from LG Electronics and . Results: The Georgia Aquarium was able to create a memorable experience for visitors with two engaging and effective entertainment platforms that offer exceptional picture quality and an immersive experience.